Nintendo revealed the first image of the 3DS XL Circle Pad Pro back in September, but failed to give us information as to when the peripheral would be released. We can now announce that the 3DS XL's bulky buddy will hit Japanese shores on 15th November at a price tag of 1,500 Yen, which approximately works out at £12/€15. There hasn't been any word of a Western release just yet, however with Monster Hunter 3 Ultimate making its way to Europe in 2013, no doubt it will make its way here. Bear in mind this is just speculation, but without a second analogue stick you wouldn't be able to use the claw item in the game, so its arrival seems inevitable. In our review of the original 3DS Circle Pad Pro, we said it made the handheld "look like it's fallen from the ugly tree and hit every branch on the way down". Does that actually matter, and do you plan to pick one of these up to give your 3DS XL that treasured second Circle Pad? No I don't need one thanks Nintendo. I ain't getting one, I have no use for it. The only game I've got that's compaitble with it is MGS: SE 3D & that plays brilliantly without one just like the PSP MGS games did. That and it blocks certain ports. I'll wait for Nyko to make a Power Grip Pro for the 3DS XL, thanks. Acts as a protective case, battery pack and additional circle pad and shoulder buttons, and doesn't look horribly obtuse. I am so disappointed that it wasn't released at the launch of the 3DS XL! Sure only a few games use it but I have been holding off playing through Resident Evil Revelations and Metal Gear Solid 3D again with out it! @luminalace I'm with you! Those are in my list to replay on the XL (along side Ocarina of Time and Cave Story 3D) but after playing them with the CPP, I can't bring myself to do it without one. If I had an XL, I still probably wouldn't get this. I figured out how to play Kid Icarus: Uprising just fine with my right hand even though I'm a lefty. I still see its usefulness, though. I need to try it before I decide, it looks... well... yeah. Then again, I need a game that supports it anyway, lol. That doesnt look so bad and its 3-in-1! Need it for RE:Relations, MGS and MH:Ultimate! Hmmm..I wonder how it will feel on the XL. Hopefully not too clunky. On the 3DS, I actually think it works very well (especially playing Monster Hunter 3G). My handhelds get console like treatment from me so bulk not an issue. Loved the first cpp it never left my 3ds and the XL version looks even more sleek. Hope we don't have to wait much longer for this in NA. I will get one. Have big hands, so it will fit better. Unsurprisingly, it looks even uglier than the CPP. The Nyko case that @Ruppeclock posted looks much better. @Boo_Buster No, the abbreviation to end all abbreviations is the one for Adventure Time: Hey, Ice King! Why'd You Steal Our Garbage!? Or AT:HIKWYSOG. Can't wait to see how the reviews handle that one. @RupeeClock Same as me the Nyko one is far superior in every way. @RupeeClock I'm looking forward to that as well although, if it takes a while to come out, I may still get this one to be able to play the aforementioned games in the meantime. I modded my original CPP already and it's perfectly functional, if not quite as sturdy, so I don't really care if they do or if they don't get one out soon. However, if I hadn't decided to go ahead and do that (Nintendo forced me to by not releasing it prior to the 3DSXL launch), I would be really mad that it's taking this long. I really liked the CPP, no matter what it looked like. It added a nice weight and grip to the old 3DS model. I Really dont care what this thing looks like, i works really well and thats what matters. Im getting the XL version as soon as it comes out to finally play RE Revelations on my XL. I cant get myself to play this game without a second stick. I'm another supporter of the original Circle Pad Pro, and personally I think the new one will be good as well. I don't have a 3DS XL, and don't particularly have any desire to change that right now, but it's great that those who updated can now continue playing with dual-analog control. Not sure if I will get it yet. I'd be lying if I didn't say. This is the most beautiful piece of kit ever. But seriously, this still won't quite sate the desires of southpaw stalwarts. If the goal of the bottom half of the 3DS is to be symmetrical, it will need to be redesigned. With a pen stylus or thumb stylus, the original DS was closer to symmetry since it used a simpler control scheme. Squeezing in analog functions with good symmetry would require squeezing in the necessary circuitry. 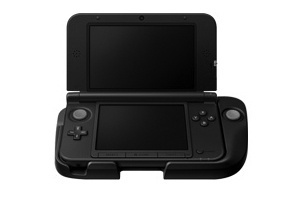 Increased dimensions, as with the 3DS XL, are not enough to satisfy conditions for comfort combined with practicality. A new design would be needed. Looks better designed than the smaller version. In fact, I find the XL still too small for perfect comfort. Your fingers still hit each other behind the console This might make it a perfect size for absolute comfort. I went to a TRU and saw its demo stand and it's 3DS was SMALLER then my original 3DS I was like WT.... Why is this small? Did they release a secret 3DS Micro? @hydeks There are considerably more reasons why it shouldn't be integrated than why it should. @WiiLovePeace not brilliantly, using buttons to aim down the sights is a bit blocky and you cant gets an as accurate shot as a circle pad considering with buttons your only got two speeds off and on you know? it would be a nice addition to games in the future like other resident evils and animal crossing, and even monster hunter.